Even as our cloudy fancies take Suddenly shape in some divine expression . . . This is the poem of the air, Slowly in silent syllables recorded —Henry Wadsworth Longfellow, "Snowflakes"
Much has been written of the ephemeral beauty and singularity of snowflakes. There is little in nature that can rival a snowflake's intricate, delicate architecture. Snow crystals are simultaneously unique yet ubiquitous in blanketing the landscape of much of the world during the winter months. 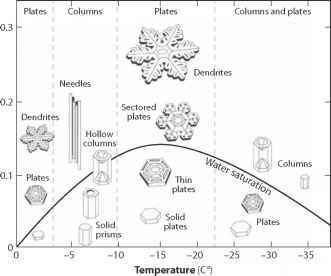 Snow and ice have unusual material properties and a very specific crystalline structure, imparted by the molecular character of water and the nature of intermolecular bonds in the ice crystal lattice. This chapter provides an overview of some of the macroscopic properties of snow and ice that shape the cryosphere and its influence on Earth's climate.